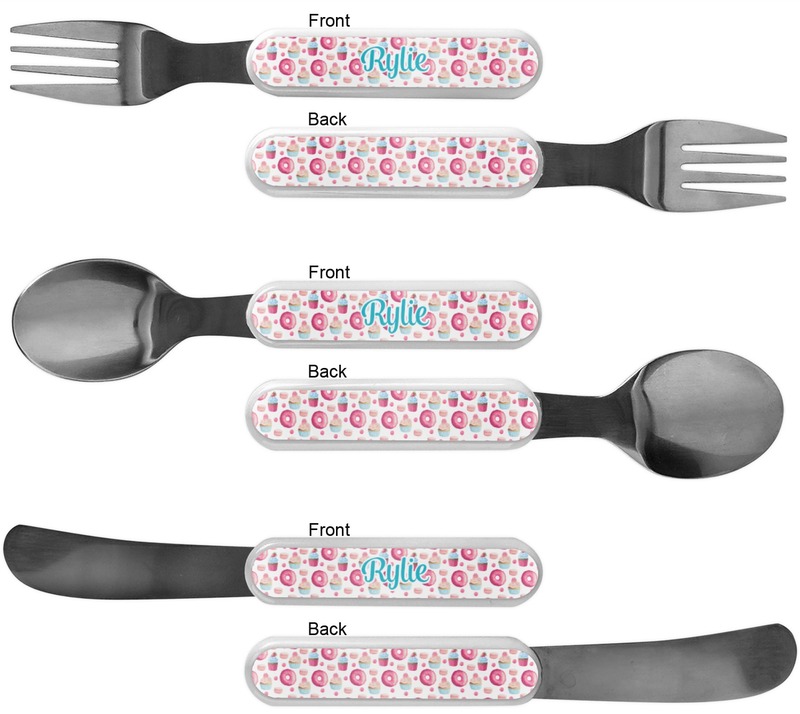 Every toddler or younger child needs their very own cutlery set. Normal cutlery is often much to large or too sharp for little ones to use, but they still need to learn how to use silverware as soon as they can! 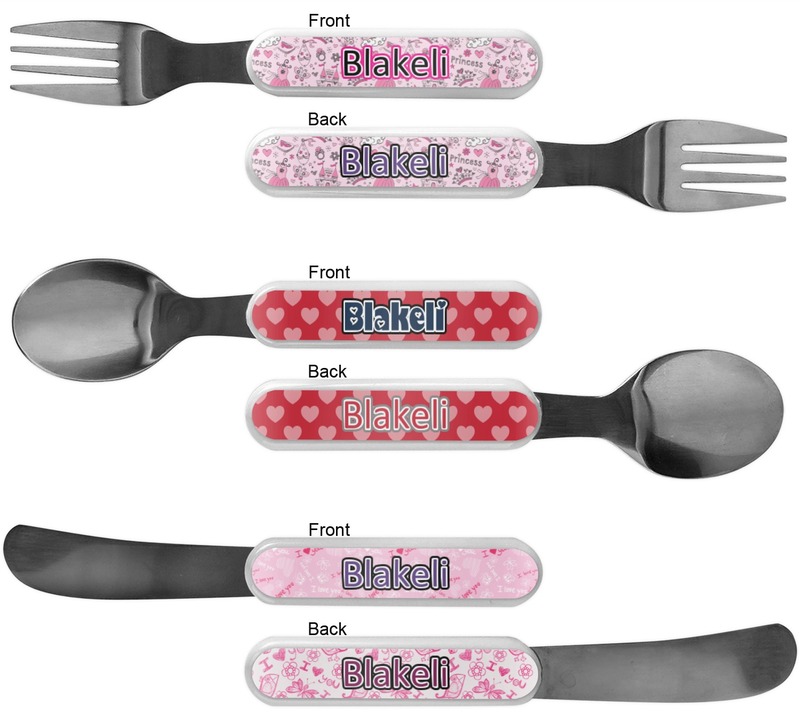 Our personalized kid's cutlery set is not only fun, but useful and functional for your child. Each piece of cutlery is approximately 7 inches in height, being the perfect size for fitting into small hands. The set comes with a fork, spoon, and knife. Each one of these pieces is especially designed for a young one with safety in mind. The fork prongs are flat on the ends, the spoon is small enough to fit into a tiny mouth, and the knife is not sharp at all, but resembles a butter knife. The tops of the cutlery are a stainless steel, while the handles are a durable plasticl. They will easily withstand the everyday use of a toddler. 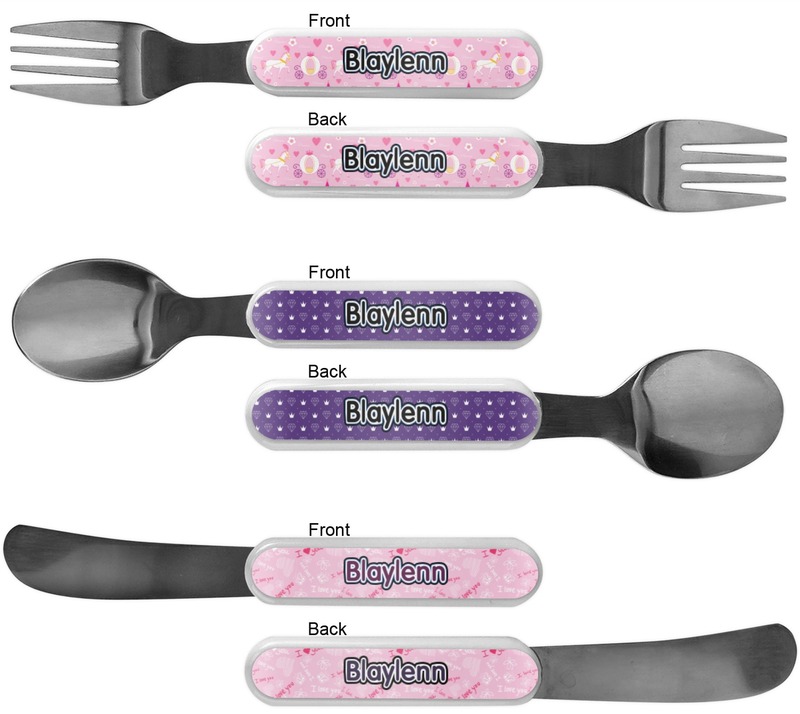 Make learning to use silverware fun for your kids by letting them choose a fun design to put on the cutlery labels! Our system is full of adorable designs and patterns that your children are sure to love. If you need any help in our design center, please don't hesitate to contact us on our online chat or by telephone! If your toddler is ready to use silverware, it's time to graduate to a big kid cup as well! Check out our amazingly durable plastic Kid's Mug. Make it a full set of dinnerware with a personalized Melamine Plate! Supper fast processing and quick shipping!! I received my order within a week of ordering!! The quality is great!! I’m very happy with my order!! This set is adorable. It exceeded my expectations and everyone loves it. Easy to order and received earlier than expected. Thank you YouCustomizeit.